Devon churchyards fall under the regulations set out by the Diocese of Exeter. This covers all of the Church of England churchyards and specifies the guidelines for permitted headstones. Any headstone that falls inside the guidelines here can be approved by the local church authorities. This doesn't mean that anything else is banned, but you do have to seek permission from the Chancellor of the Diocese of Exeter, this is called a faculty. Providing that the headstone is of good design and suitable for the churchyard. More leaway is often granted for headstones in Devon burial grounds that are separate from the church building, especially in the choice of stone used for the memorial. Obviously, some churches in Devon are buildings of great historic importance, and there are other laws and regulations governing what is permitted in their grounds. 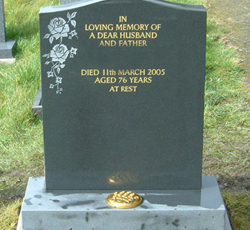 This is something that we can help you with, ensuring that the headstone you choose is going to be permitted. For your benefit, we've included a breakdown of the key regulations as outlined for headstones in Devon churchyards. Remember, these are not entirely comprehensive, nor does exceeding these guidelines automatically result in your memorial being refused. These guidelines should be taken as just that when considering the dimensions and appearance of headstones. Upright headstones can be no more than 4 ft (1.2m) tall, 3 ft (9.1m) across, and 6" (0.15m) thick (this does not include headstones made from slate which are permitted at 1½" (0.038m) thick. The height and width of headstones for infant burials is approximately one third of this. 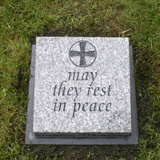 Flat stone memorials covers headstones no more than 9" (0.22m) high, with a base that extends no less than 3" (75 mm) all round and is flush with the surrounding turf. The maximum dimensions for the headstone and base is 7ft (2.1m) long by 3ft (0.9m) wide. Bases for headstones to stand on must be made from the same stone and be integral to the design. The base should be no wider than 4" (0.1m) in any direction than the headstone, unless it includes a receptacle for flowers, when it can be up to 8" (0.2m) to the front of the headstone but must be flush with the top of the base. This does not cover foundation slabs, which should be poured or pre-cast concrete, either poured or pre-cast, and may not be visible once the monument has been completed. No memorials should be made from synthetic materials. Only natural stones that are, or closely resemble those used in traditional local buildings in colour and texture should be used. Durability should also be considered, meaning that granite, marble, and slate are the most suitable stones. The stone may be finished as rustic (rough/matt), fine rubbed (smooth/gloss), but may not be polished to a reflective finish. Black or blue granite headstones may not be darker than a 'Rustenburg grey', and red granite should only be used where the church and/or surround buildings are of a similar colour stone. White marble is only permitted for headstones on infant burials. Designs should be traditional. Crosses and sculptures will need the approval of the Chancellor, but they do not want to discourage and statuary or crosses, providing that they are of a suitable design. 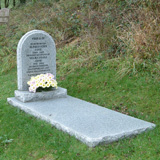 Headstones with a curved top design is preferred over straight-edged rectangular shapes. 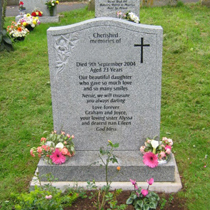 Contemporary designs such as memorials shapes as hearts or books are not permitted. 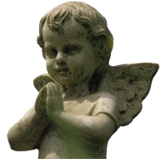 Decoration to the headstone in the form of photographs or any other form of portrait, kerbing, metal chains, fencing, or railings, or gravel/chippings/glass is not permitted, and unlikely to be approved. Inscriptions on the headstone are to be kept as simple, respectful, and of Christian significance. Lettering must be incised into the stone, and may be finished in paint coloured either black, white, or silver. Gold leaf is permitted for the lettering, but not gold paint. Neither plastic lettering, nor lead inlaid lettering is not permitted. Subsequent additions to an inscription must be approved separately.